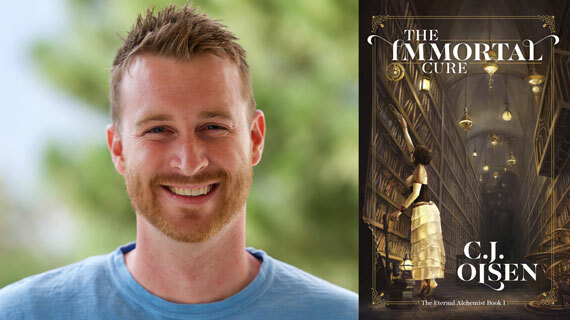 Chandler Olsen, an admissions advisor at Southern Utah University, recently published his first novel, The Immortal Cure, the first of a six-book series. A release party for his book will be held September 12 in the Sharwan Smith Student Center from 11:00 a.m.- 1:00 p.m. Since he was young, Olsen has always had a deep passion for stories. Growing up in California he would spend his free time coming up with imaginative scenarios and playing them out with the neighborhood kids. Now he seeks tales in all different types of media such as books, movies, TV series, anime, manga, and video games. He hopes to continue writing for years to come. The Immortal Cure takes place in a world of Steampunk. Olsen traded out the dragons and magic for alchemy, chimera, golem and technology. It follows Charlotte who is the daughter of an immortal tyrant. In order to stop his rule she must find The Immortal Cure, or a way to reverse his immortality. It’s an action adventure story with an epic journey, a light romance, and a deep mystery involving immortality and its consequences. Olsen has already received rave reviews and sold out all his copies at the Salt Lake City FanX event. To learn more about the six-book series visit Olsen’s website at The Eternal Alchemist.